The 5C’s Model | Unleash Your Unstoppable Life! I grew up in a military family. My grandfather, father, uncles, aunt, and cousins served as enlisted personnel in all four military services. They felt it was ones duty and an honor to Serve your Country. They served during World War II, The Korean Conflict, the Vietnam War, and the Gulf War. Because of their Service my family instilled in me service to the Nation and the value of the Five Cs — Character, Competence, Courage, Commitment, and Choice. Each of these lessons where critically important in my growth and development. Service to the Nation is why I chose to serve in the Air Force and why the 5Cs are the underlying foundation of Unstoppable Leadership. Despite being taught these valuable lessons it was not until it was not until I joined the Air Force that I truly understood the significance and meaning of both these lessons on my life and leadership. It was during Basic Military Training (BMT) that the 5Cs lesson began to unfold. One of the first things they provide you at BMT is the big book of success–the training manual. Inside this book was everything you needed to know in order graduate from BMT and be successful in the Air Force. The book established the expectations and standards for a successful career. It specified the roles and responsibilities for each rank and it explained the significance of each core value. The book gave you road map to get promoted but it was up to you to navigate the critical path. The 5Cs was the key and the compass to navigate the map. Character: Character plays a vital role in your life and leadership. It is integral to honest leadership and is the difference between success and failure. The core values of Integrity First, Service before Self, and Excellence in All We Do established a core foundation for building my character and establish my leadership expectations. What are your values, beliefs, and worldview? What kind of leader will you be? The key BMT lesson in character was that living your core values every day is an important aspect of your character in action. Our true character remains hidden until our actions and words reveal it. It cannot be touched but is it felt by others through our actions. It remains unseen until other see it in our deeds. Competence: Competence plays a vital role in your technical expertise. Competence is a measure of your level of ability and expertise. It defines your technical expectations and helps you define what talents, abilities, capabilities, and skills you need to be the expert. The more competent you become, the more others trust in your expertise and ability. The key BMT lesson in competence was that you must be passionate about growing, developing, and reinventing yourself to hone your competence to a fine edge. Your level of competence directly relates to your ability to influence your team or organization. The more competent you become, the more others trust in your expertise and ability. Courage: Courage is not the absence of fear, but the willingness, ability, and commitment to act in the face of our fears. It is getting out of your comfort zone and taking the risk to lead and live greatly. It takes a lot of inner strength to do what you think is right even though it may not be easy. It takes courage to sacrifice for those we lead each day. The key BMT lesson in courage was as a leader you needed to set and enforce the standards daily and being the living example for your people every day. You are accountable and responsible for mission accomplishment. You are accountable means you are fully responsible for the assigned task, job, or project and responsible for it success or failure based on your actions. You must have the courage to lead each day despite the challenges. Choices: Everything you do to be successful is based on your decisions, choices, and actions—you are responsible and accountable for your choices and decisions. It is by choice, not by chance, that you will determine your life. All life and leadership begins with a choice. The key BMT lesson in choices was it begins by you taking responsibility and accountability for your choices. Each day you choose to believe in yourself, your abilities, your courage to act, and your daily direction. Choice plays an important and powerful role in your life and leadership BMT established the unshakeable foundation for a successful career and successful leadership. Everything else I did in my career was based off the lessons learned during my induction to the Air Force. The next book of success was AFI 36-2618, The Enlisted Force Structure. This book established the criteria for leadership and development levels and responsibilities. AFI 36-2618 gave you a path to be successful leader and subject matter expert. It gave you the knowledge and understanding of what was expected of you at each level of responsibility and career level. Again, the 5Cs was the major theme in my development. Character: Integrity is the cornerstone of a leader’s character. It is the stamp of an authentic leader. Integrity must remain intact or a leader loses credibility and becomes untrustworthy. Character begins with you inner core. Defining your character begins by reflecting on who you are and seeing if your actions reflect positively on you as a person of character.The Key AFI 36-2618 lesson in character was the foundation of trust is found in the integrity of the leader. No matter the leader’s competence, courage, commitment, or even or rank, if they sacrifice their integrity they sacrifice their trustworthiness as a leader. Character is key part of the unstoppable inner core, shaped by our purpose, values, beliefs, and worldview, and manifested in our character authenticity, integrity, trust, and credibility. Competence: Competence is the mastery of your abilities, skills, talents, aptitudes, and capabilities. To maintain your competence level you must commit to lifelong development and growth. Your competence must be grown, developed, and honed each day of your life. The key AFI 36-2618 lesson in competence was a leader knows their strengths and weaknesses knows what kind of expertise they will need to learn to keep proficient and effective. Pursuing mastery and continuing to grow, develop, and reinvent yourself empowers you for greater leadership roles and responsibilities. Your level of mastery is determined by the quantity and quality of hard work you put in to education, experience, development, and learning. Continuous learning helps you stay competitive by developing new capabilities and skills. Commitment: It is an unwavering choice to grow and develop on a daily basis. Commitment allows you to keep your character intact during trials and challenges and builds trust, credibility, and respect through your commitment to live by standards and principles. The key AFI 36-2618 lesson in commitment was as a leader of a team or organization your people will watch to see if you are committed to living the core values, and living the standard, and then they will follow your lead. Commitment shows in your attitude and actions and by being personally dedicated to organization goals and values. Choices: Your destiny and career are determined by the choices you make. Your decisions are the single most important factor that drives your life. Your decisions are the A.I.R. (Action, Impact, and Result) or the breath of life you take each day to live. Each decision is made from your action, the impact of the action, and the results of that action. The key AFI 36-2618 lesson in choices was as a leader your decisions and choices have significant consequences in your life and leadership. At times, being the leader, requires that you make unpopular decisions for the right reasons. Combined all these lessons taught me the value of a lifelong commitment to growth and development. It is never too early or too late to become a better leader I needed to continuously grow, develop, and reinvent myself if I wanted to be the very best leader for the Air Force. The 5C’s Model represents what I learned from Family, My Service to my Nation, and Leadership Lessons along the Way. 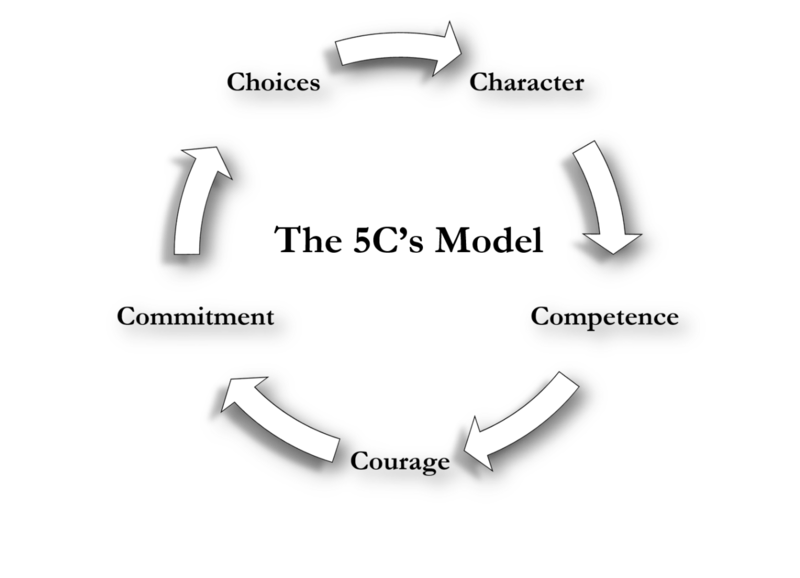 Each of the 5C’s — Character, Competence, Courage, Commitment, and Choice are interconnected and guide me through each step of my life and leadership. In everything, you do, set your leadership on the foundation your character, competence, courage, commitment, and choices to move forward and to take action. Take the risk to conquer your fears. Take the risk to lead in the great adventure called leadership. It is your leadership; take the risk and become an unstoppable leader. This entry was posted in The Unstoppable Leader and tagged #tchat, Actions, believe, Business, character, choices, commiment, competence, confidence, courage, decisions, development, Discipline, experienced, F(X) Leadership, military, unstoppable, USAF. Bookmark the permalink.